Over at the Karens Doodles Challenge this week you had to choose a line from a bingo sketch. I have chosen the top line which is 'Buttons, Ribbon & Flowers'. The image is Karens Doodles 'Flower Girl' and you can buy it here. I have coloured her with Promarkers. The sentiment is PC generated and everything else is from my stash. Wonderful card! I really liked how you cut her out and the layout of the card is great. Thanks for playing along at Karen's Doodles this week. What a sweet card! I love Pink! Thank you for playing with the Pixies this week! 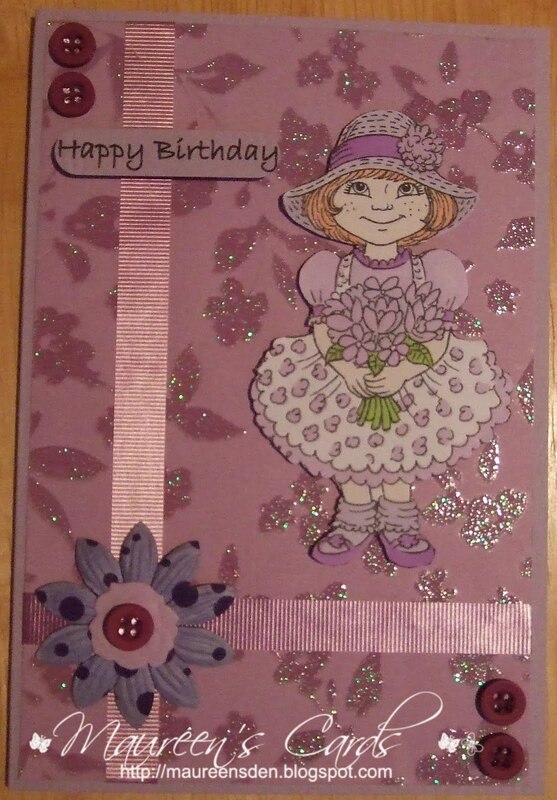 Super card Maureen, love your added sparkle and embellishments, its fabulous! Well, she is just lovely! Thanks so much for playing along with the Pixies this week! What a sweet little card. Love that image! Thanks for joining us at Karen's Doodles!